On Monday I was at Sadler’s Wells in London for the Arts Council England event on “Understanding the value and impact of cultural experiences”. This event marked the launch of a literature review commissioned by ACE from WolfBrown. Alan Brown and John Carnwath of WolfBrown explained that they had been asked to gather literature from around the world on the intrinsic value of arts and cultural experiences. They looked at what people mean when they talk about value, impact and meaning in relation to the arts and culture. They identified three meanings of ‘value’: the value of cultural experiences to individuals; the value represented in cultural organisations; and the value to society of a thriving cultural sector. The literature review concentrates on the first two meanings. 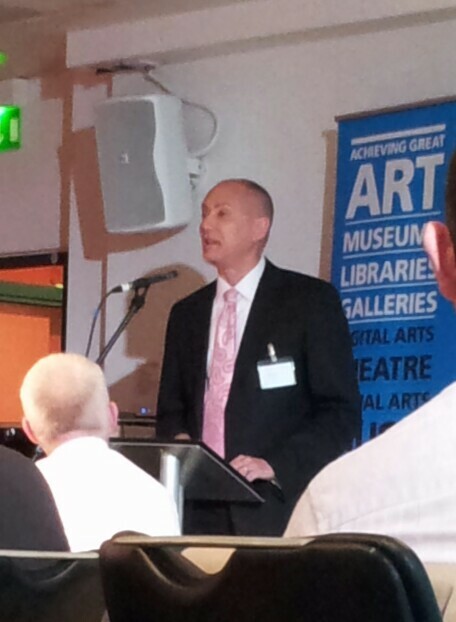 John Carnwath spoke about the intrinsic and instrumental benefits as they are experienced by the individual. He described peaks of impact decreasing (or sometimes increasing) over time – with some cultural experiences resulting in impressions that linger in audiences’ minds weeks later. Alan Brown outlined the ‘creative capacity’ of organisations as six core elements: 1. Clarity of intent and commitment to risk taking; 2. Community relevance; 3. Excellence in curating and a capacity to innovate (new works are not necessarily innovative); 4. Technical proficiency, skill and artistry; 5. Capacity to engage audiences; and 6. Critical feedback and commitment to continuous improvement. These elements are backed up by two conditional elements: supportive networks and sufficient risk capital. After the WolfBrown presentation we heard from Nick Merriman, Director of Manchester Museum, and Catherine Bunting about the Manchester Quality Metrics pilot. Inspired by an Australian example and developed for Manchester by John Knell, the pilot has been working with a number of arts and cultural organisations to trial before and after surveys – for audience members, arts organisations and peers – using tablet computers. The next phase of development has been funded through the Digital R&D for the arts fund (supported by ACE, NESTA and AHRC) and will comprise a 12-month project to refine the metrics, wider testing, automating the system, exploring how to incentivise public feedback, and carrying out academic research. ACE has published a report on the quality metrics pilot which is available at: www.artscouncil.org.uk/what-we-do/our-priorities-2011-15/quality-metrics/quality-metrics-pilot/. Finally we heard from James Mackenzie-Blackman (from New Adventures and Re:Bourne), Caroline Sharp (from the National Foundation for Educational Research) and Ben Lee (from Shared Intelligence) about quality principles for work by, with and for children and young people. Caroline said they had identified seven principles characterising high quality work. I was intrigued to hear her make a distinction between young audience members, participants and artists. What is the difference between a ‘participant’ and an ‘artist’? The ACE event was interesting and thought-provoking but I found the lack of attention to active participation, in relation to the value and impact of cultural experiences, frustrating. On Monday I chaired a meeting of Connection Culture, the Peterborough Creative People and Places consortium, at the Key Theatre in Peterborough. Connection Culture is a three-year programme, funded by Arts Council England, to achieve a step-change in arts engagement in Peterborough. We plan to do this through three main strands of activity – focussing on young people, diverse communities and voluntary arts groups – linked by a ‘Chamber of Culture’ which will provide training, mentoring and networking to each of the three strands. On Monday we were joined by Jan Kofi-Tsekpo from Arts Council England. We updated Jan on our progress and discussed issues relating to the programme budget and risk assessment. We also talked about learning points from the recent national peer learning meeting of Creative People and Places consortia in Doncaster. On Wednesday afternoon I met Kate Mason from the Campaign for Drawing. The Campaign for Drawing has been working for 14 years to raises the profile of drawing as a tool for thought, creativity, social and cultural engagement. They promote the importance of visual literacy – drawing in the broadest sense (see: http://www.campaignfordrawing.org/). Each October, The Big Draw festival involves more than 1000 organisations across the UK and in twenty other countries. Last year there were 282,000 participants in The Big Draw (see: http://www.thebigdraw.org/). Kate and I discussed the potential for developing links between the Campaign for Drawing and Voluntary Arts online information services. We also talked about the possibility of a partnership between Voluntary Arts Week and The Big Draw. On Wednesday I chaired a meeting of the Cultural Campaigning Network. This is a forum for national organisations involved in campaigning on cultural issues which allows us to share our advocacy plans and identify opportunities for collaboration. This week we discussed the Arts Council England National Portfolio Organisation funding decisions. We also heard updates on the National Campaign for the Arts ‘ 50p for Culture’ campaign (http://www.50pforculture.org/), ‘My Theatre Matters’ (http://www.mytheatrematters.com/), and Making Music’s work to secure the future of Leicester Music Library (http://www.makingmusic.org.uk/our-work/news/news/leicester-music-library-making-music). I spoke about our plans for a joint Voluntary Arts/Arts Development UK initiative to explore new models to sustain and develop local cultural infrastructure. We then had a presentation from Luca Bergamo and Clymene Christoforou about the Culture Action Europe annual conference which will take place in Newcastle-Gateshead from 9 – 11 October 2014 – the first time the conference will have been held in the UK – see: http://www.cvan.org.uk/news/2014/6/26/the-culture-action-europe-annual-conference-to-be-held-in-newcastle-gateshead. We also had a presentation, from Joseph Young of AIR Council, on the ‘Paying Artists’ campaign, developed by a-n (The Artists Information Company), which is seeking to highlight and challenge the fact that visual artists in the UK are regularly expected to develop and exhibit their work without a fee – see: http://www.payingartists.org.uk/. Later on Tuesday I was at the National Council for Voluntary Organisations (NCVO) in London for a meeting of the Cultural Commissioning Programme Advisory Group. The Cultural Commissioning Programme is a three year programme funded by Arts Council England and being delivered by NCVO, New Philanthropy Capital and the New Economics Foundation. On Tuesday we had a presentation from Hazel Summers, Head of Commissioning at Manchester City Council, about how Manchester has adopted a broader system approach to place-based commissioning. It was particularly interesting to hear from Hazel and Advisory Group member Jo Johnstone, who is the Cultural Partnership Team Leader at Manchester City Council, about how their two teams are working more closely together. We also reflected on the two recent Arts Development UK national seminars on cultural commissioning. We were updated on other components of the Cultural Commissioning Programme including the two commissioning partner pilots, in Gloucestershire and Kent, and the learning programme which starts with a first set of events in Newcastle which will help cultural organisations put themselves in the shoes of commissioners. We also heard about the Cultural Commissioning Programme online peer learning community and the development of web based resources. On Monday I was in Cardiff for a meeting of the Arts and Humanities Research Council Connected Communities Advisory Group. The Connected Communities programme is pioneering co-production of academic research with communities. Our meeting took place just before the start of the Connected Communities Festival in Cardiff which attracted more than 600 delegates. Gary Grubb from AHRC updated us on recent developments within the programme, including the Research Development Workshop which took place in March, the development of five First World War engagement centres, and the creation of an early career researchers strand in the Connected Communities Festival. We also discussed the programme’s international strategy and how to develop the theme of cities and communities.